Hello friends! 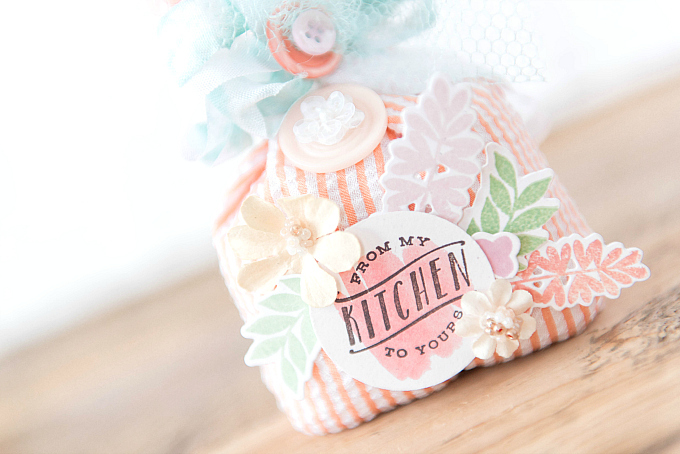 Today I'm sharing a little bit of a duo perfect for home-y gift giving. I am so in love with gifts from the kitchen and I think there is nothing quite like warm, comforting goodies, lovingly shared with someone special. Whatever the occasion - a shower, a party, feeling under the weather - it's just the perfect little something-something. That is why you'll find the little packaging corner of my craftroom full with fabrics, wrapping papers, bows and boxes, ready to be filled, decorated and shared! 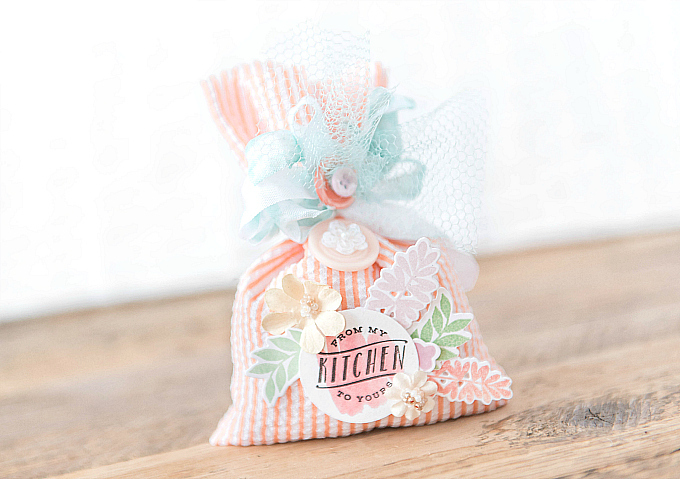 Every so often, I'll whip up little pouches for an added special touch, so today I am sharing one of these with you! It was inspired by a challenge over on the PTI blog, to create something with stripes. But first, I'll share my coordinating card. 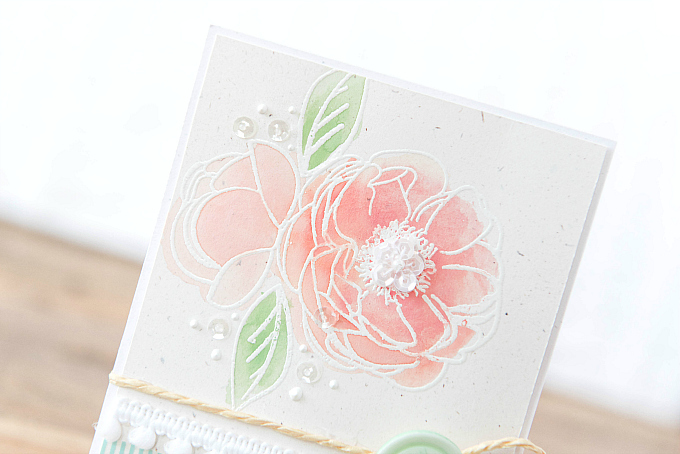 To start, I stamped a beautiful set of peonies from the Peonies on Parade stamp set, onto Rustic Cream cardstock , embossing them in white. I then used a little bit of watercolor to shade in the petals and leaves. Since I was working on plain cardstock, I was careful not to add too much water. I have a little tutorial here on how I achieve soft colors while keeping water to a minimum. I added a bit of dazzle to the flower by stitching a few sequins together into a little flower, and adhering it to the center of the large peony. I also added sequins around the flower, along with some liquid pearls. At the bottom of the card, I added two strips of washi tape, as well as some pom pom ribbon, string and a pretty mint button. It's a super simple card, but I think it makes for a perfect companion to the little pouch. 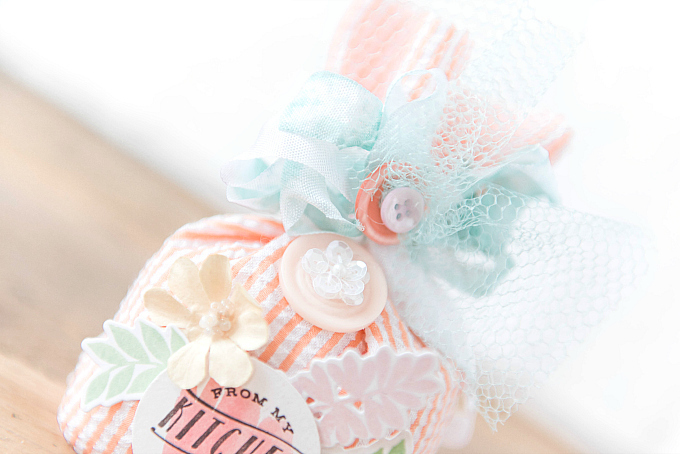 For the little pouch, I used some candy colored striped fabric, and glued the edges together to create a baggie. I couldn't think of a better way to showcase stripes for PTI's challenge! I used some scrunched ribbon for fastening the baggie, and some mesh and buttons to spiffy up the closure. Just below that, I added another sequin flower and button, as well as a fun little arrangement of leaves. 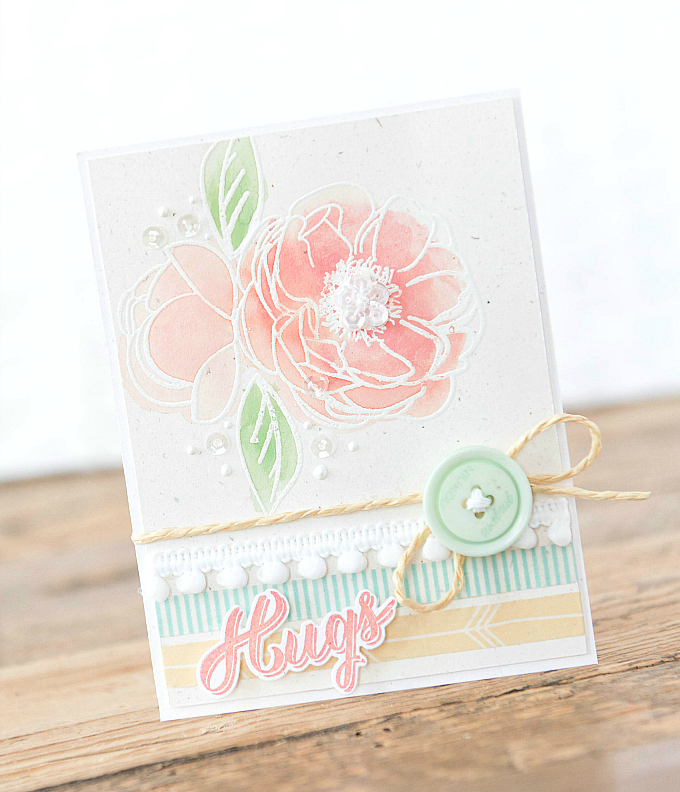 I used PTI's Leave it Be stamps and dies, as well as leaves from WPlus9's Fresh Cut Florals. 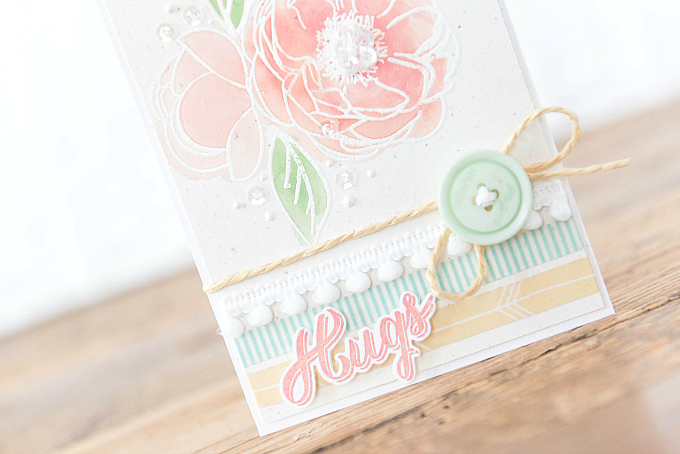 I used Melon Berry, Vintage Jadeite, Lavender Moon, Sweet Blush and Smokey Shadow inks for stamping. Thanks for joining me today and for all the sweet words! Oh my is this ever dreamy! I always love your soft colors. That little bag is adorable, the perfect stripes! : ) The addition of stamped cut=outs is the perfect touch! Wow--you have such a wonderful style! The card is just gorgeous! Love your coloring & how you stitched the sequins together for the center! Thank you so much, Greta!! 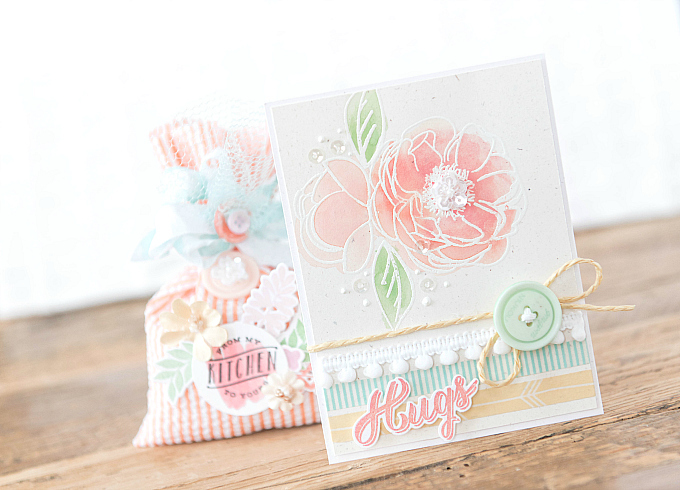 So nice to see you here :) I love your beautiful cards and visiting your blog was just delightful! Sending crafty hugs!